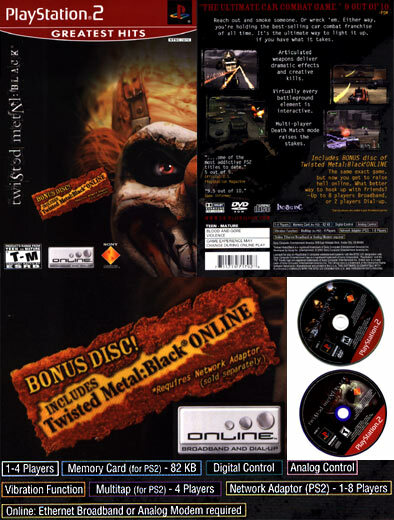 Playstation 2 Online - View topic - Twisted Metal Black Online - NOW IN STORES!!! Topic: Twisted Metal Black Online - NOW IN STORES!!! For months people have been asking wether you can still send in the mail coupon for a free copy of Twisted Metal Black Online. Then only to be met with a preverbial "NO you cannot", or a return to sender from sony. One of the playstation's most recognizable and long lasting franchises was brought online....however shoved aside in an abscure mail order...that only lasted for a limited time period. Those currently gaming on TMB:Online were diehard twisted metal fans or those fortunate enough to get the game. Who knows how many gamers have the disc they recieved in the mail sitting around their house collecting dust, while those actually seeking out the disc have to scour eBay. Well thanx to registered user DragonSlayer3288 who ventured out to his local Best Buy, and found a newer greatest hits version of Twisted Metal Black. Now on store shelves is a Greatest Hits version containing both the original Twisted Metal Black and Twisted Metal Black Online in a complete package. That's right TMB:Online is now for sale in stores. The price is $19.99 and can definatly be found immediatly at Best Buy's, and most likely other stores. I was unable to find any web announcment about the product. No box art or release information. All the online stores continue to display the solo TMB Greatest hits that only contained the offline version. This must have been a new release that just got onto stores in the past week. I was even at best buy before christmas and I clearly saw jsut the normal plain greatest hits version of TMB with no online disc. Sony finally releasing this game in stores was a smart move. Its a flagship title that should have been pushed MONTHS ago. Their meager non-sports lineup has been met with few new titles, and twisted metal black online still reigns as one of the best DM games in sony's lineup. Not only does it show they answered to customers plea for access to this game, but it also shows they support the game as a TRUE online game and not some free mail order disc. So you have no excuses. Its sitting in the store right now waiting for you to pick up a copy and for only $19.00. Need a visual cue on what to look for? I made a complete packshot here from my newly aquired copy. Enjoy. I picked this up yesterday and I have to say, it rocks! If you havn't played Twisted Metal Black before, or just havn't played it online, do yourself a favor and go grab this package. It's well worth it! Brace yourself for a world of collisions, carnage and maniac motorists. Twisted Metal: Black thrusts you on a demented journey through a landscape full of four-wheel horror. This online version of car combat craziness provides game modes loaded with destruction, torture, humiliation and pain. Twisted Metal: Black Online lets you bash and crash through a dark world where every car is gunning for you. Four dynamic game modes, including Death Match, Last Man Standing, Man Hunt and Collector, will keep your heart pumping and your reflexes twitching. You will also find 20 playable levels from the current world of Twisted Metal: Black, as well as 15 playable vehicles made famous in the Twisted Metal: Black multiplayer modes � all in addition to the Twisted Metal: Black Online new world of infinite possibilities. Join your friends � and enemies � online and prepare for battles that just might leave you as twisted as the scrap metal on the screen.